Union Budget 2017–18: How Kerala Fared? Kerala’s polity was highly critical of demonetisation, perhaps, more than that of any other state in the country. The fiscal situation in Kerala, already challenged by fiscal distress, worsened following the ban on Rs.1000 and Rs.500 notes announced on November 8, 2016. In fact, the Government of Kerala struggled to disburse salaries and pensions during the subsequent months. Following demonetisation, tax collection in the state declined from 17 per cent in October 2016 to a meagre four per cent in January 2017. The tertiary sector contributes to the highest share (62 percent) of Kerala’s Gross State Domestic Product (GSDP). Within it, over the years, tourism has been one of the major contributors accounting for nearly 12 percent of GSDP. It was reported that the tourism sector registered an estimated loss of Rs. 1000 crore post demonetisation, alongside a dip in domestic and foreign tourist arrivals. As a consequence, despite Kerala being a digital state with 100 percent banking penetration, demonetisation dealt a huge blow to the already fragile Kerala economy. Regardless of the bleak economic scenario that Kerala faced, there was intense expectation from several quarters that the union budget for 2017-18 would help lift the ailing economy from the negative impacts of demonetisation. Whether this expectation was justified and whether Kerala will benefit from the announced budget, the article will elaborate upon in the next paragraphs. While, Kerala is known for its achievements in the fields of education and health, when it comes to infrastructure development, Kerala bears the tag of an infrastructure deficit state. Successive governments, over the years, both at the State and Centre, had taken measures to improve the infrastructure facilities in the state. However, the success rate of these measures was far from the optimal, which has led Kerala to lag behind other states in infrastructure development. When prioritising the infrastructure needs of Kerala, the up gradation of the public transport system becomes one of the most urgent needs. In fact, Kerala’s usage of railway line capacity has reached its limit and there is an urgent need to lay an additional parallel line (double lining) to ensure efficient railway services. Although this process has been under way for a while, it has taken up considerable resources and time. In this regard, of the total allotment to Southern Railway in the 2017–18 budget, Kerala received a share of Rs. 1,206 crore compared to the allocation of Rs. 1,014.06 crore during the 2016–17 budget. It is one of the highest allocations to Kerala, providing financial support to the state to speed up the process of railway line doubling. The Sabari rail project, a special project targeting pilgrims visiting Sabarimala and sanctioned in 1997–98, envisages a fresh 120-km railway line from Angamaly to Erumeli (near Sabarimala), connecting the hilly regions of central Kerala. The project which is yet to complete land acquisition received a shot in the arm, when it found a place in the Pro-Active Governance and Timely Implementation (Pragati) scheme, which monitors and reviews important programmes initiated by the Central and State governments. In addition to the funds received by the railways, Kerala is also due to get its share from the increased national budget outlay of 64,000 crores towards the development of national highways. Thus, overall, Kerala is likely to benefit in the long run. Nevertheless, the issue of land acquisition for development purposes has remained a perennial cause of worry for the State Government. In fact a large majority of state infrastructure projects are delayed, on account of failure in land acquisition. Despite all the budgetary allocations towards building railway lines and highways, and land acquisition being a state subject, if the Kerala government cannot resolve acquisition with speed, it is likely that Kerala may not gain quickly from it. Kerala has the highest number of PACs (11,565) in the country, with a total deposit of Rs. 1.83 lakh crore. The above figures explain the important role played by cooperative societies in helping Kerala to achieve 100 per cent banking penetration. Demonetisation followed by the restriction imposed on PACs in exchanging Rs. 1,000 and Rs. 500 notes have brought the cooperative societies in the state to a standstill. PACs in Kerala were the most targeted post demonetisation, as they were considered as the storehouse for black money in the state. The latest Union budget has brought relief to the sector. The Finance Minister (FM), in his budget speech, acknowledged the important role played by PACs, stating that 40 per cent of small and marginal farmers avail credit from the cooperative structure. He has set apart Rs. 1,900 crore for computerisation and integration of PACs with the Core Banking System of District Cooperative Banks. As per the Economic Survey (2015), the total number of MSMEs registered in Kerala is 249,696 with a total investment of INR 1,673,851.70 lakh. Employment generation in the MSME sector is 1,274,385 with close to 5.62 per cent of the country’s small and medium enterprises located in Kerala. Clearly MSMEs play a significant role in the Kerala economy and such organisations which run on an annual turnover of less than 50 crores will benefit through the reduction in corporate tax from 30 to 25% as announced in the recent union budget. Having said that, it may also play a detrimental role, since such organisations may prefer to limit their scale of business to less than 50 crore per annum. Thus reducing the incentive for such organisations to grow big. In his revised budget for the fiscal 2016–17, Kerala FM had proposed a ‘Special Protective Package’ for reviving the Kerala State Road Transport Corporation (KSRTC). The package proposed to roll out 1000 CNG-operated buses in Kochi. The proposal was meant to cut down the cost of running KSRTC, one of the biggest and unprofitable public sector units in Kerala. The state is also planning to fuel all the KSRTC buses with CNG in the next five years. Kerala will thus have an added advantage with the reduction of customs duty for LNG from five per cent to 2.5 per cent. On the other hand the support system provided by government to revive KSRTC has so far been unhelpful. While, the share of KSRTC in passenger transportation is around 11 per cent, the total accumulated loss of the unit is pegged at Rs 4,217 crore. Meanwhile, the conversion of KSRTC buses to CNG can put a heavy cost on the exchequer. This comes at a time when the debate on the ability of private buses to convert to CNG is not given its due in Kerala, even though the share of private buses in passenger transportation is 89 per cent. Kerala accounts for more than 80 per cent of the country’s rubber production. The rubber producers in the state as well as the State Government were expecting special schemes for the sector in the budget. But the rubber sector did not find a mention in the budget speech, and there was no substantial increase in the allocation to the rubber board. Rubber is a highly subsidised sector in Kerala. It finds a special mention in all State Budgets, mainly due to the high vote bank. For instance, the Government of Kerala allotted Rs. 500 crore for the sector in the budget for the fiscal year 2016–17. The heavy support system by the State Government is in addition to the support provided by the rubber board. But this support system has not helped the sector much. The production of rubber in the state declined from 783,485 MT in 2008–09 to 507,700 MT in 2014–15. This shows that the heavy spending by the government on the sector has not transformed into a corresponding increase in rubber production. Coupled with this, there has been a fall in the price of natural rubber due to developments at the global level. A decline in crude oil prices has made synthetic rubber more attractive as synthetic rubber is made from the by-product of crude oil. Now with a slow rise in crude prices, the price of natural rubber is slowly picking up. Now the whole debate is whether, government intervention by providing a high Minimum Support Price (MSP) in the rubber sector is the solution. It is clear that based on market conditions, prices will fluctuate and should the government continue to protect the rubber sector, it will be forced to do the same with all sectors. In conclusion, it is clear that the Union Budget 2017-18 did not fully meet the expectations of Kerala. Nevertheless, the state government has initiated a budget for the first time in Kerala’s history where the estimated expenses will be Rs. 119,601.94 crores. At the same time, fiscal deficit is also set to increase to 25,756 crores. Under the circumstances it is clear that the state should not promote more sops and schemes but focus on ensuring reforms happen across various state policies that are deterring Kerala’s economic growth. 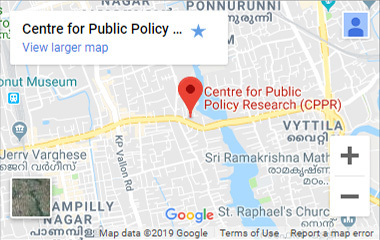 *Deepthi Mary Mathew is Research Associate at CPPR-Centre for Comparative Studies. Views expressed by the author is personal and does not reflect that of CPPR.